To view 9 more pictures, interactive maps and the full, detailed description of the Emerald Forest community, please Login. Emerald Forest is one of the new home communities Hampton Roads is talking about. Homes for sale in this neighborhood of properties are giving homebuyers what they want- a fine living oasis within city limits. 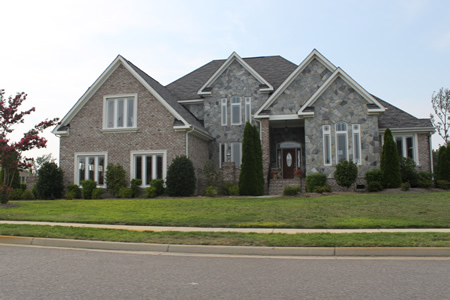 The Greenbrier section of Chesapeake is where these new homes are quietly tucked back near green fairways. Residents needing daily access to military bases are in luck as Norfolk Naval Shipyard, NAS Oceana and Dam Neck are within minutes away. New home communities with everything found in these quality built properties are not easily found in Hampton Roads, VA. Each of the homes for sale here in Emerald Forest may feature three-car garage, double hung DP50 windows, aluminum gutters, brick exterior, Kenmore Elite appliances, 48-inch maple cabinetry, granite kitchen countertops, ceramic tile backsplash, direct vent gas fireplace, hardwood flooring, built-in bookcases, arched doorways, attic storage complete with pull-down stairs, master bathroom Jacuzzi tub, master bathroom bidet and much more. Amenities that come along with living the good life in Emerald Forest are just another perk for those buying one of these homes for sale. All of the finely built properties dot the well-manicured grounds of this lavish neighborhood. The highlight is that Emerald Forest borders part of the Greenbrier Country Club championship golf course. This club offers swimming, tennis and fitness facilities to keep residents fit and healthy. Children can even come along for the youth activities. One might say Chesapeake is the heartbeat of southeast Virginia. This city is full of energy and opportunity. Shoppers have a haven here, as they can choose from various malls, shopping centers and boutiques to find whatever they want. Water enthusiasts can enjoy sailing, fishing, kayaking, water skiing and more on the Intracoastal Waterway. Not all new home communities are this in tune with what residents want. Lavishly living the life you dreamed of is no sin. Just make sure you get everything on that list when looking at homes for sale. Properties may look sparkly and new but look beyond the veneer and see if they are made as well they seem to be. New home communities like Emerald Forest offer so much for those who deserve the finer things in life. Send me more information about the Emerald Forest new home community. Our agents gladly offer FREE property tours of Emerald Forest, Chesapeake and homebuyer consultations to all serious buyers.